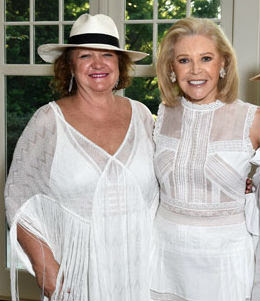 Whisper's New York spy disguised as an Upper East Side socialite has spotted Australia's richest person and the world's richest woman Gina Rinehart at several parties around town as our exclusive snaps show. On the weekend Gina attended a White Tea garden party at the ritzy Southampton home, Fairwind thrown by philanthropist Audrey Gruss. That was to launch four new products in Gruss' Hope Fragrance where 100% of profits go to the Hope for Depression Research Foundation, a charity started by Gruss in honour of her mother Hope who suffered from depression most of her life. The guest list comprised of many of the US names from the Social Register: Sharon Bush, Kathy Hilton and Luce Churchill. Yes, they are all related to famed gents with the same moniker. A few days later Rinehart also attended a charity fundraiser for the Prostrate Cancer Foundation hosted by Michael Milken once jailed for two years and fined $600M for selling 'junk bonds'. 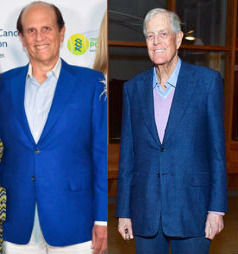 Milken has successfully re-invented himself as a charity fundraiser. That party was also attended by David Koch of the influential Koch brothers, As far as wealth goes, Koch is worth an estimated $47B, Gina Rinehart currently is worth around $12B personally while Milken gets by with just a lazy $1B. Rinehart has a New York penthouse which sensibly has a drive-in elevator for one's limousine which travels to your apartment so your feet never need touch the pavement. How the other half live!